Clone the entire category tree instead of creating it from scratch. 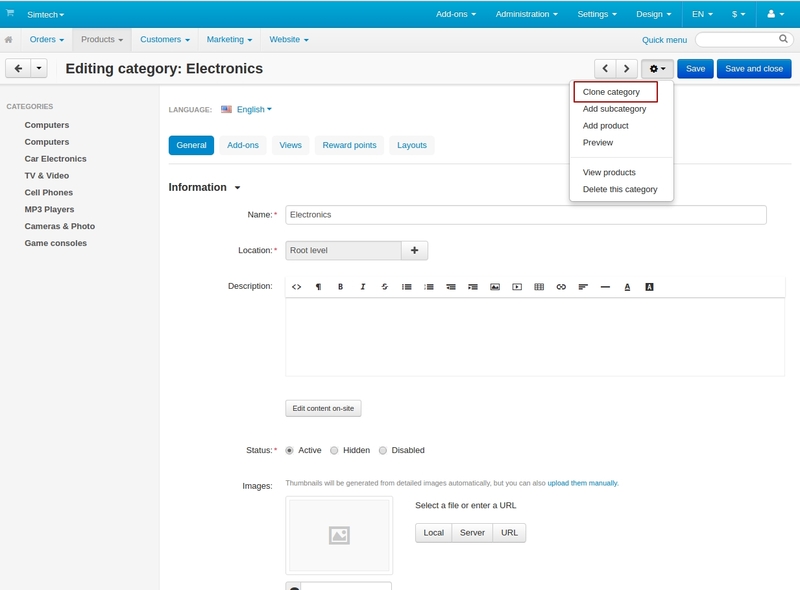 The Clone categories add-on allows you to get a copy of an existing category with just a few clicks. It will be especially useful for those who create complex categories with multiple sub-categories. For example, if you already have the “Men’s Clothing” category you can set up the “Women’s Clothing” category just by duplicating the category tree. Then you can edit the cloned category if necessary. — The ability to clone categories with / without subcategories. — Postfix for the cloned categories. — The ability to copy the category structure. — Automatically disabled status for cloned categories which allows you to edit them before they are active. Learn more about the add-on in our User guide. The add-on is compatible with CS-Cart and Multi-Vendor 4.3.1 and above. Need compatibility with another CS-Cart version? Contact us now. No feedback yet. You have a chance to be the first. [+] The license key validation has been added. [!] Product position was lost during category cloning. Fixed. [+] The ability to clone products was included.